I am fairly new to woodworking and just starting to outfit my shop with power tools. One area that I find confusing is the use case for a jointer vs. a planer. Both tools seem to have very similar capabilities, and probably could substitute for one another on certain jobs. I've got a limited budget and space. So I need to prioritize whether to get a planer or jointer. Versatility will definitely be a priority in this decision. In the interest of making the answer useful beyond just my situation, I'm looking for an answer that summarizes for each tool which tasks they are ideal for, which tasks you can reasonably manage with them, and tasks which just aren't advisable/possible. Any other guidance in your answer as to deciding between these two tools is also welcome. A planer is used for making two edges parallel while a jointer is used for making straight or flat surfaces. Let's say you have a warped board (suppose it looks like a banana from end to end). If you pass it through a planer, it will enter as a banana and exit as a banana. A jointer, on the other hand, will shave off bits of the banana, little by little, until it comes out flat. So, you need both. There are ways to rig a planer to flatten a board, but I don't think there's a way to make the sides of a board parallel with a jointer. Edit With limited budgets, it's probably not a bad idea to look into a jointer/planer (e.g., https://www.grizzly.com/products/G0675). One cutter head is used for both planing and jointing--it just requires some sort of adjustment. I don't know how that adjustment is done because I don't own one. (I didn't learn about these until after I bought both a jointer and a planer). have the lumberyard surface and straightline your lumber. They do an okay job, but if you're making fine furniture, don't expect your piece to be perfectly square. Surface your material with a handplane. This is a long process (and quite tedious), and it may cost you quite a bit to get a good hand plane capable of doing the job. I agree that you should have both. However if there were budget and space considerations I would go with a jointer. A jointer is going to enable you to get those precise surfaces for joining your wood. A planer on the other hand is a smoothing/sizing tool and much of what you do with it can be done with a little more elbow grease using hand planers and sanding. Often when you are purchasing rough cut lumber at specialty lumbar yards they can run your purchase through a planer. 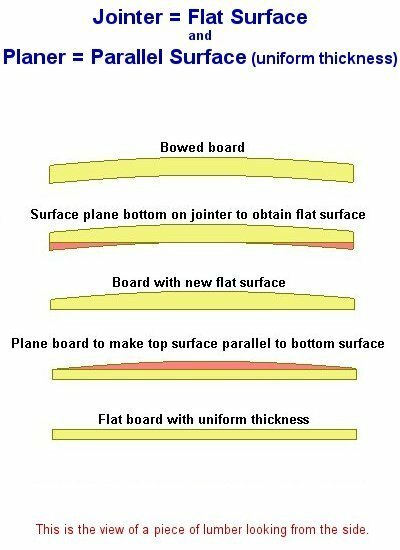 To the fine answers already posted, I would just add this: The jointer can give a board a perfectly straight edge, which is an important first step in accurately cutting the board to width and length. The straight, jointed edge runs along the tablesaw's rip fence when you are cutting the board to width, yielding an opposite edge that is also straight, and parallel to the first. When crosscutting, the jointed edge gets held against the miter gauge or crosscut sled to help ensure that the freshly cut end is square - at 90 degrees to the board's long edge. I agree with the statement that an active woodworker could really make use of both a dedicated jointer and surface planer. But I only have a surface planer due to my very small workspace and I have made-do with hand tools for jointing. This is due to the fact that most of my work involves typical boards that are 3/4" thick and a few inches wide. To joint the edge, I will run a Stanley #7 hand plane over the edge (this length of hand plane is called a "jointer" - I think it's 20 inches long). If I need to flatten one face (which is very rare - only if I have a rough-sawn board), then I can still get it flat with the hand planes. I use a combination of a Stanley #5 and the aforementioned #7. The #5 is fitted with a cambered blade which removes wood more aggressively. One those occasions when I need to use a jointer to ensure a square cross section (such as glueing up several pieces to make a square bed post), I still use the hand planes and just get it as close as I can. I check frequently with a square. In my bed project, it was never all that important that I get the angle perfect; once things were together, the gaps closed up fine. To have had a dedicated jointer would have been nice and, as an engineer, I would have felt good about having perfect 90 degree angles all around, but in the end it worked out fine that I was simply close. Not the answer you're looking for? Browse other questions tagged tools jointer power-tools thickness-planer or ask your own question. When building a shelving unit, how does having the rails and stiles be out of square affect the alignment of the shelf? What is the best way to get started with limited funds and space?